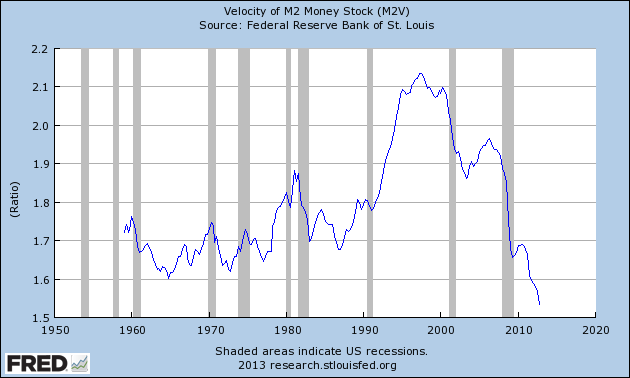 This entry was posted in Uncategorized and tagged economic indicators on January 31, 2013 by Ted Kavadas. In the December 3, 2012 post (“3rd Quarter Corporate Profits“) I displayed, for reference purposes, a long-term chart depicting Corporate Profits. 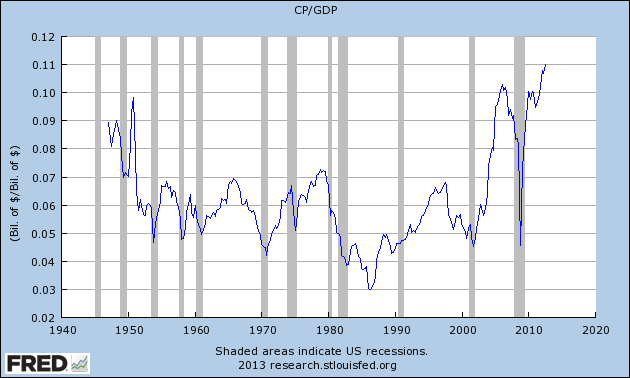 As one can see from the long-term chart below (updated through 7-1-12), Corporate Profits as a Percentage of GDP is at levels that can be seen as historically (very) high. While there are many reasons as to why this is so, from a going-forward standpoint I think it is important to recognize both that such a notable condition exists, as well as contemplate and/or plan for such factors and conditions that would come about if (and in my opinion “when”) a more historically “normal” ratio of Corporate Profits as a Percentage of GDP occurs. This topic can be very complex in nature, and depends upon myriad factors. In my opinion it deserves far greater recognition. This entry was posted in Business and tagged Business on January 30, 2013 by Ted Kavadas. 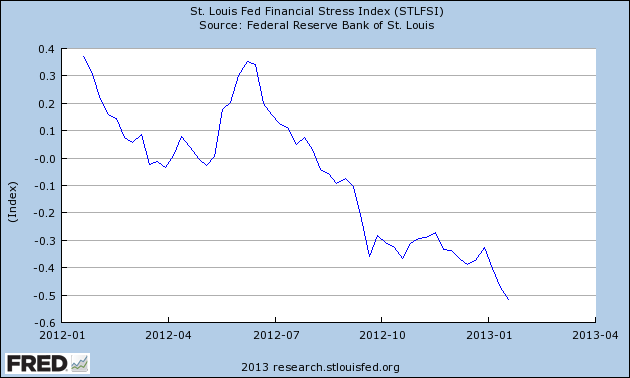 This entry was posted in Uncategorized and tagged economic indicators on January 29, 2013 by Ted Kavadas. 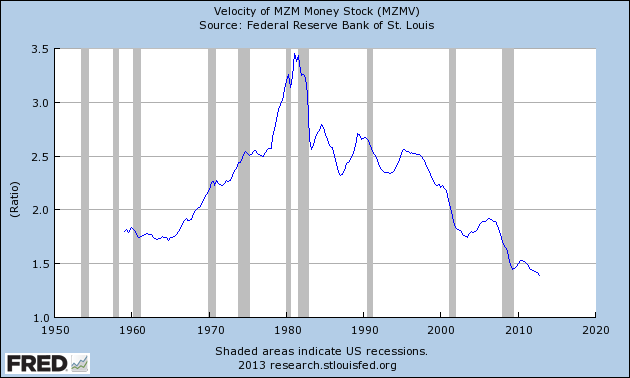 Doug Short, in his January 25 blog post, titled “Median Household Incomes: Down .5% in 2012” produced the chart below. It is based upon data from Sentier Research, and it shows both nominal and real median household incomes since 2000, as depicted. 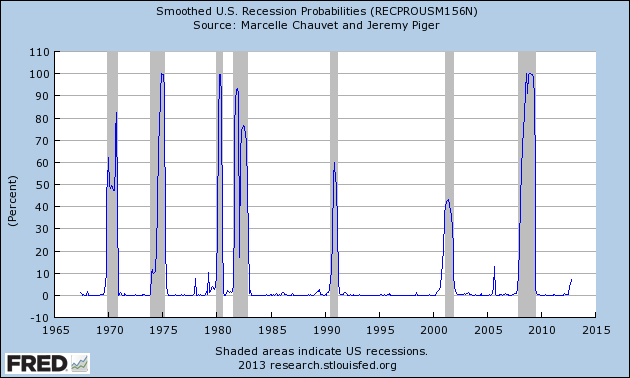 As one can see, post-recession real median household income (seen in the blue line since 2009) is especially worrisome. Nominal household incomes rose 1.3% for the calendar year, but adjusted for inflation, household incomes declined by 0.5%. Real household incomes have essentially been flat for the past seven months and are down 7.9% thus far in the 21st century. This entry was posted in Uncategorized and tagged Household Income on January 28, 2013 by Ted Kavadas. Below are three long-term charts, from Doug Short’s blog post of January 25 titled “ECRI ‘Recession’ Update – Leading Index Growth Hits a New Interim High.” These charts are on a weekly basis through the January 25 release, indicating data through January 18, 2013. 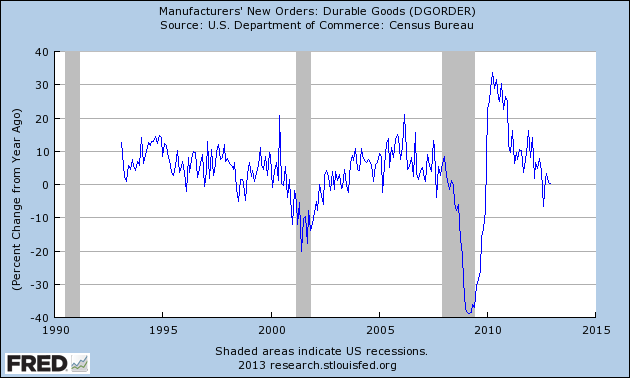 This entry was posted in Economic Forecasts and tagged ECRI on January 25, 2013 by Ted Kavadas. This entry was posted in Economic Forecasts and tagged Economic Forecasts, economic indicators, STLFSI on January 25, 2013 by Ted Kavadas. With regard to our current economic situation, my thoughts can best be described/summarized by the posts found under the 20 “Building Financial Danger” posts. 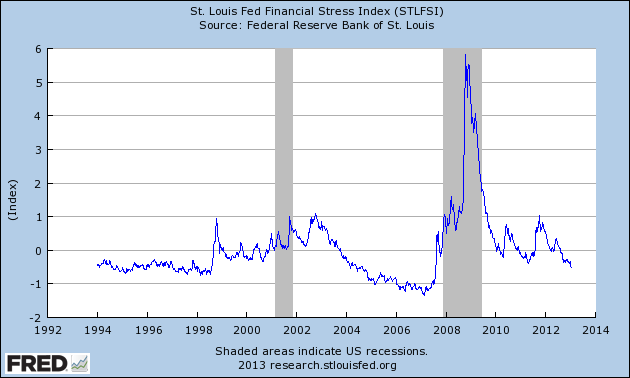 This entry was posted in Uncategorized and tagged current economic situation on January 24, 2013 by Ted Kavadas. As of 1/18/13 (incorporating data through 1/11/13) the WLI was at 130.4 and the WLI, Gr. was at 6.1%. 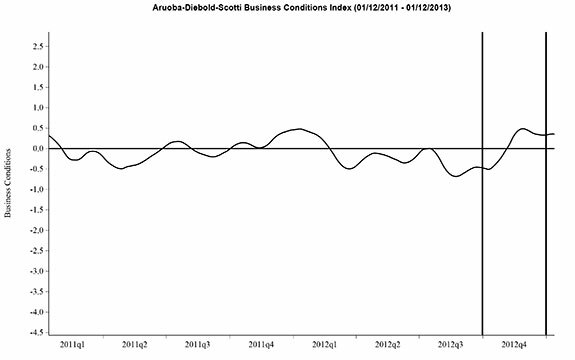 This entry was posted in Economic Forecasts and tagged ADS Index, Aruoba-Diebold-Scotti Business Conditions Index, Chicago Fed National Activity Index, Conference Board CEI, Conference Board LEI, economic forecasting, economic indicators, ECRI on January 23, 2013 by Ted Kavadas. Currently (last updated January 15, using data through December) this “Yield Curve” model shows a 5.74% probability of a recession in the United States twelve months ahead. It showed a 6.42% probability through November. This model, last updated on January 2, 2013, currently shows a 7.34% probability using data through October. 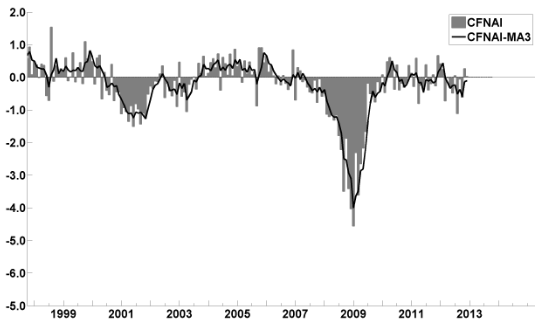 The two models featured above can be compared against measures seen in recent blog posts. For instance, as seen in the January 14 post titled “The January 2013 Wall Street Journal Economic Forecast Survey” economists surveyed averaged a 19% probability of a U.S. recession within the next 12 months. Of course, there is a (very) limited number of prominent parties, such as ECRI (most recently featured in the January 18 post titled “Long-Term Charts Of The ECRI WLI & ECRI WLI,Gr. 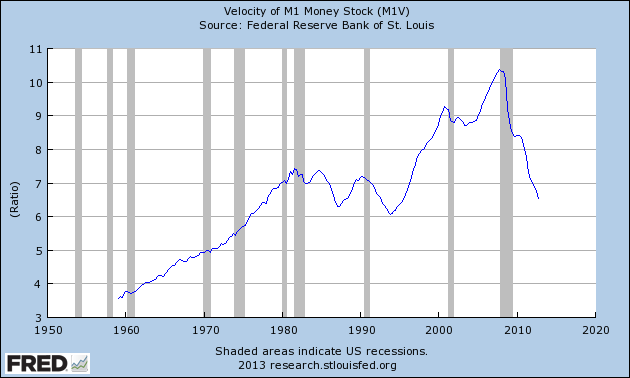 – January 18, 2013 Update“) that believe the U.S. is already experiencing a recession. This entry was posted in Economic Forecasts and tagged economic indicators on January 22, 2013 by Ted Kavadas. Below are three long-term charts, from Doug Short’s blog post of January 18 titled “ECRI’s Public Indicators Continue to Undermine Their Insistence That We’re in a Recesion.” These charts are on a weekly basis through the January 18 release, indicating data through January 11, 2013. 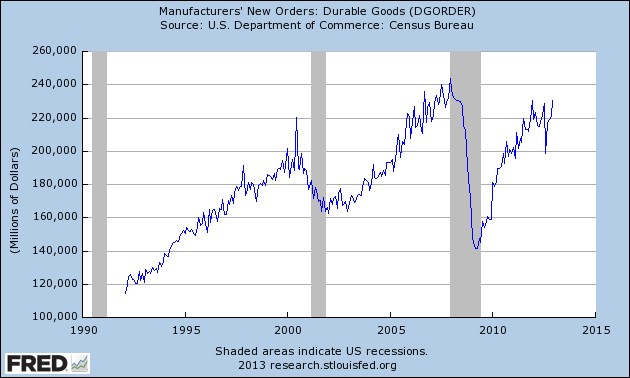 This entry was posted in Economic Forecasts and tagged ECRI on January 18, 2013 by Ted Kavadas.